Mark Pickup is a Canadian writer. His commentaries are widely published throughout North America. He is incurably ill and disabled with multiple sclerosis. "Have you ever wondered why God put his precious gift of life in such fragile packaging? If life is so sacred and precious - as the Scriptures proclaim - then why did God place it in bodies made of flesh and bones? Skin and flesh tear and bleed; bones and hearts break." "Why didn't God encase his precious gift of life in bodies as tough as granite with the human psyche safely guarded, as though behind some fortress? Such thoughts occasionally arise within me from a desire to protect loved ones from life's pains and sorrows. After all, there would be no need to wipe away tears if none are shed. But then, humans encased in bodies like granite, with hearts like stone, would be of no use to God or man. Granite is impenetrable. Hearts of stone would never ache, break or melt." The above is a small snip from, Love will ultimately prevail dated Wednesday, April 4, 2007. 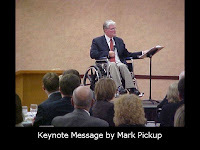 Visit Mark Pickup's blog reflections often at http://humanlifematters.blogspot.com/ or http://markpickup.blogspot.com/ . Alberta Pro-Life Society sent me a link to the most profound 1 minute video called "In the Blink of an Eye." (See http://www.aish.com/movies/blinkofeye.asp) . It moved me beyond words. I sent it to the HumanLifeMatters email address book. Go to the web link and view it for yourself. A Jewish man named Dr. Rachamin Melamed-Cohen is completely immobilized with Lou Gehrig’s disease. He exhorts us to "Choose Life." Why would someone in such a difficult physical position choose life? The world of modern bioethics would assert he does not have a life worth living, that his quality of life is insufficient – an yet he says only one thing: “Choose life.” Why? As a Christian disabled with MS, I am in complete agreement with Dr. Melamed-Cohen's profoundly simple statement. “This saying is trustworthy: If we have died with him we shall also live with him;﻿ if we persevere we shall also reign with him.” (2Timothy 2.11-12). We must not despair. We know we will one day stand face to face before Christ and we will know just like we are known (1 Corinthians 13.12-13). August 21st 2007 was an uneventful day for most people, but not me. My fifth grandchild was born. To most people, baby Erin Marie is just another wrinkled, nondescript newborn--but not to me. She’s my granddaughter! Baby Erin (and millions of other newborns) represent hope for the future. 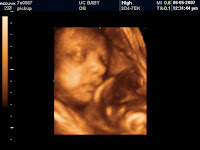 You may remember the 3-D ultra sound image of Erin at six months gestation I included in a previous blog entry this past June. It generated a lot of responses from readers asking if they could share it with others as an example of the dazzling new technology of chronicling life in utero. If you missed it, here’s another copy. Although Erin made her grand entrance on August 21st, her humanity began long before that date. From the point of her conception, Erin became a member of the greater Human Family, just like we all did at the point we were conceived. 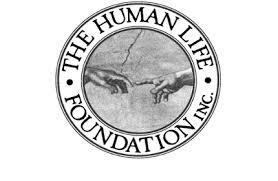 The human life journey is represented by words like embryo, fetus, newborn, child, teenager, young adult, middle-age, elderly and aged. Each phase is marked by physical and mental changes but the humanity of each individual remains intact throughout every stage. The exact day a baby became a toddler is hard to pinpoint. It’s not when the baby takes his or her first step or necessarily when they walk. It happens almost imperceptibly. One day the parent realizes their baby is a toddler. It is the first of many realizations. One day, years from now, when Erin is a mature adult, she will notice that her mother is growing older. Perhaps Erin will notice crows-feet lines around her mother’s eyes or the first hints of grey hair at her mother’s temples. Whatever it is, Erin will probably be saddened by the realization. She will undoubtedly wonder how she missed her mom’s signs of aging until that day. It seemed to happen overnight. But it did not. A gradual transformation was occurring all along, unnoticed (or denied) until then. It will bear silent witness to the fact that time is slipping away, even for Erin. Growth and aging are gradual and continual regardless of when it is noticed. They are the two constants every member of the Human Community experiences in their life journeys. If there is such a thing as a human community to which we all belong (and there is), then each phase of human development, each individual, must be protected and cared for by our mutual nurture of each other. Our collective embrace must encompass life beginning in the womb through to its end nearing the tomb. The greater human community depends upon it. To arbitrarily interrupt another’s life continuum is an assault on the greater community and weakens our bonds of interdependence. Abortion is an abomination because it cuts off the possibility of a future, and the prospect of growth, for the particular individual in question. It is the preposterous presumption that an individual – just beginning its life journey – can be sacrificed because it will inconvenience another life further along the same continuum. Abortion is the denial of hope and interdependent community. Abortion weakens the bonds of the human community, and severs human connectedness for one life and frays it for another. The same is true about euthanasia of the sick or aged. A year ago my 92 year old mother was dying of cancer. During the last few days of her life she ate and drank nothing. She was unconscious. The nursing staff asked if the family still wanted meals brought for her. I said, “Yes” even though the meals remained uneaten, only to be taken away later. I did not want the routine maintained for my mother’s sake – she was unaware of the meals being brought – I wanted the nurses to continue bringing the meals for their sake. Even though it did not for my mother I believe it might have helped to refine the humanity of her nurses. By going through the motions of bringing meals to an unresponsive, dying old woman was like making small stand against the notion that there is such a thing as care that is futile. There is no futile care, only futile treatments. Food and water are not medical treatment. Today, my granddaughter baby Erin Marie came home from the hospital to the loving and ready home of her parents. I will do my small bit, as her grandfather, to help nurture her through her childhood to be a well adjusted young woman capable and willing to participate in the gentle art of human nurture to others she encounters. The need for care and nurture never stops from the beginning of life until death arrives and the human journey is over. Opus Dei - a work of God. I was having a telephone discussion with Wesley J. Smith. He’s a good friend and confidant. At one point during our conversation, he asked me if I had ever considered joining Opus Dei. * As a matter of fact, I have flirted with the idea; I’ve been receiving their electronic newsletter for a few years. With Wesley’s prompting, I attended an Opus Dei meeting. Quite frankly, I did not know what to expect. The church where the Opus Dei meeting was held had a number of people quietly praying before the Blessed Sacrament. A priest delivered a half-hour reflection. He spoke about time: The difference between wasted time and time well spent serving God, our families and communities. Good stuff. There was opportunity for confession for interested participants. In an adjacent room to the chapel, an Opus Dei member gave his insightful thoughts about prayer. Then there was more meditation in the chapel before the Blessed Sacrament and a final reflection by the priest to assist those present in their Christian walks. There were no sinister monks (albino or otherwise) lurking in the shadows. That was the bigoted anti-Christian fiction of Dan Brown’s novel The Da Vinci Code. I think I might join Opus Dei. Granted, I have been unable to work in years because of multiple sclerosis. Still, I believe that even my circumstances of everyday life -- relegated to a wheelchair -- can be fertile ground for growing closer to God. Already in my personal disability journey spanning m ore than 20 years, I have been able to serve others facing the consequences of catastrophic disabilities or chronic illnesses. And in my small and impotent way, I hope I’ve been able to serve society. Perhaps my service to society takes the form of bearing witness to inviolable dignity of all human life – even imperfect human life, like me. We can challenge society to include those who may difficult to include, or those who bring discomfort to sophisticated or polite company. We call those around us to a higher standard of love and friendship. We can knock at the door of mainstream society and demand admission and reasonable accommodation so that we can find our rightful places in the world. If the disabled and incurably ill despair of life, we need people to lift us up as indispensable members of society and worthy of life. We do not need the abandonment of a utilitarian society eagerly agreeing to assist with our suicides, or euthanasia of those who can't communicate to defend themselves. * Opus Dei (Latin for the work of God).